Club Penguin Cheats by Mimo777 Club Penguin Cheats by Mimo777: New Club Penguin September 2010 Clothing Catalog Sweet Cheats! 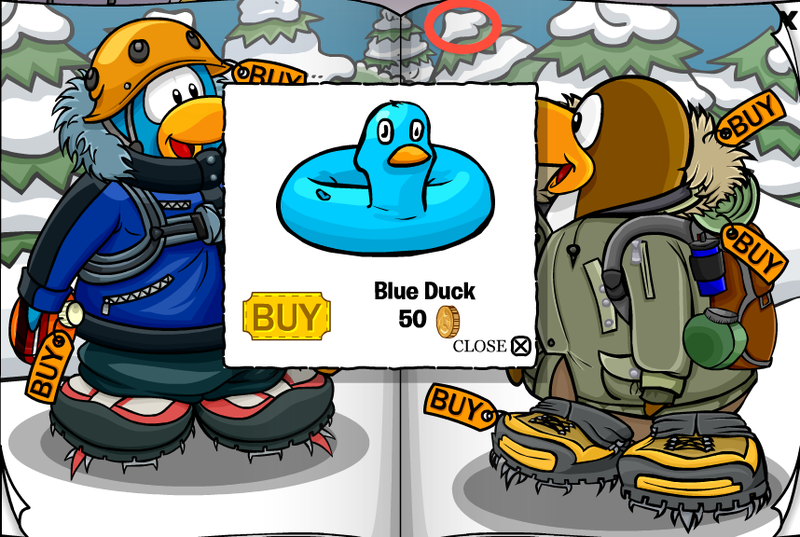 New Club Penguin September 2010 Clothing Catalog Sweet Cheats! 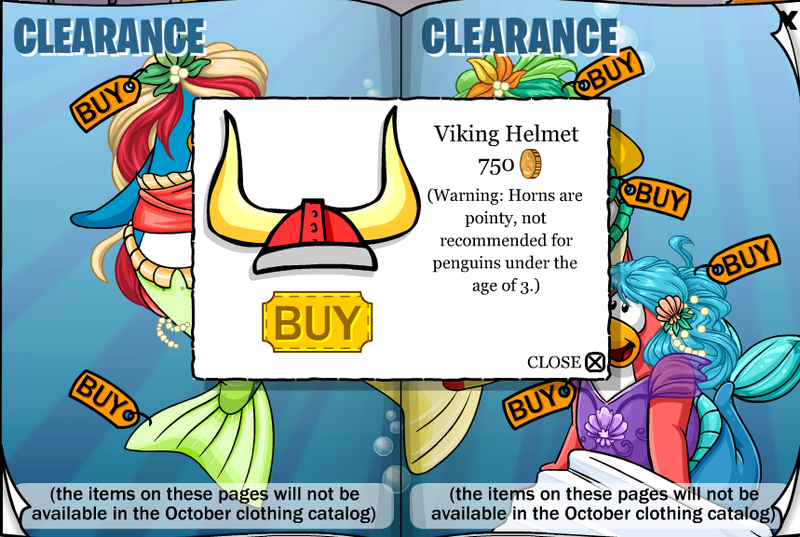 The hidden Club Penguin Cheats in the Penguin Style Clothing Catalog for September 2010 are here! Step 5. Click to the 4th page. You now have the Ring Master Outfit, Hat and Curly mustache cheat. Step 7. Go to the 6th page. Step 8. Click on the penguins beak. 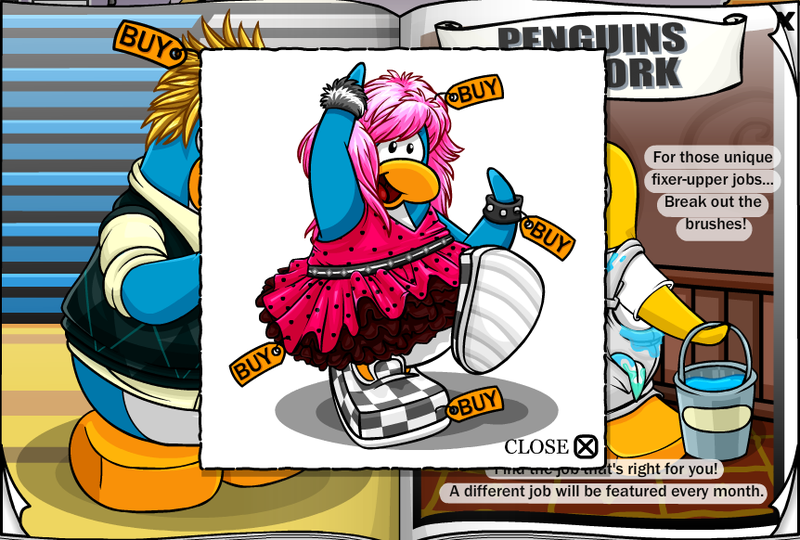 You now have the Shock Wave, Spiker Cuffs, Pink Polka Dot Dress, and Black Checkered Shoes cheat. Step 9. Go to the 7th page. Step 10. Click on the left mountain top. 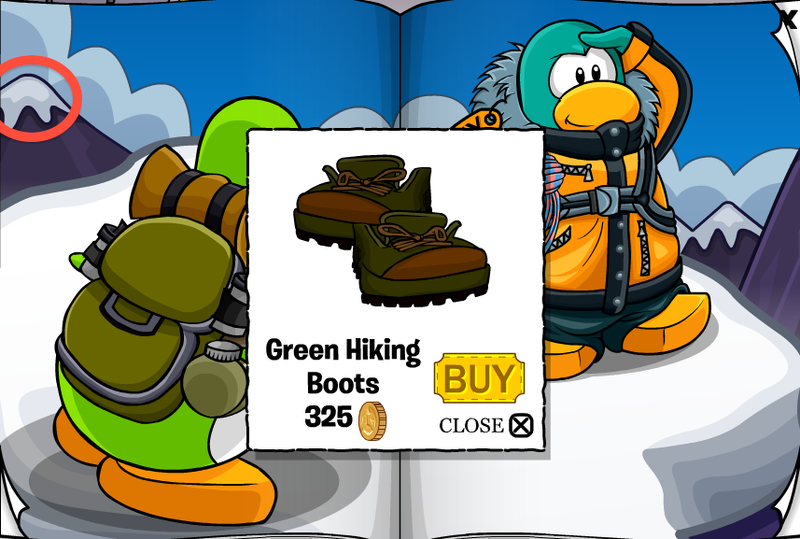 You now have the Green Hiking Boots cheats! Step 11. Stay on the 7th page. Step 12. Click on the green penguins foot. You now have the Lasso cheat! Step 13. Go to the 8th page. Step 15. Stay on the 8th page. Step 16. 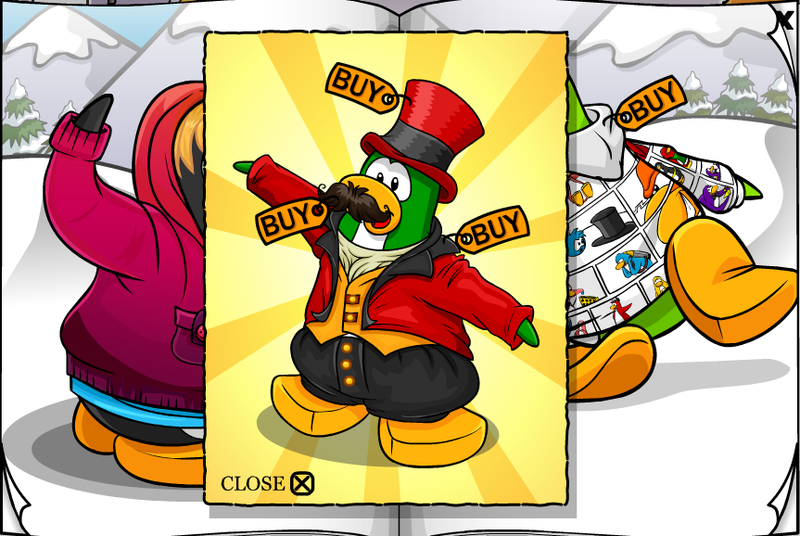 Click on the penguin's eye. You have now found the Hiking Boots and Mountain Climber cheat! Step 17. Go to the 9th page. Step 18. Click on the top of the tree. You now have the 3D Glasses cheat! Step 19. Go to the 9th page. Step 20. 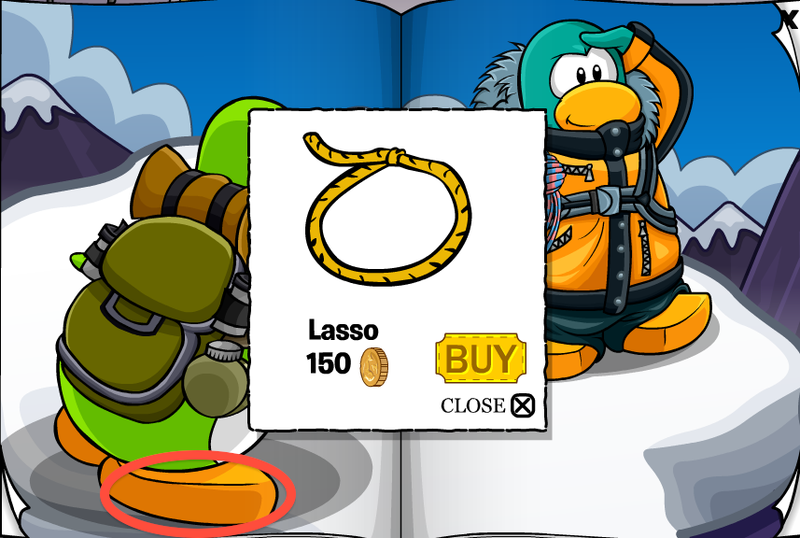 Click on the bottom of the penguin's foot. You now have the Acoustic Sunburst Guitar cheat! Step 21. Go to the 10th page. Step 22. 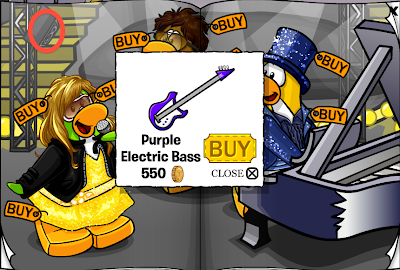 Click on the 1st button on the speaker. 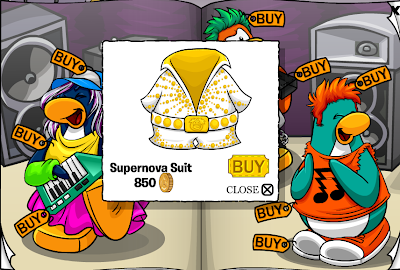 You now have the Supernova Suit cheat! Step 23. Stay on the 10th page. Step 24. Click on the 2nd button on the speaker. You have now found The Rocker cheat! Step 25. Stay on the 10th page. Step 26. Click on the other speaker. You now have the Blue Sunglasses cheat! Step 27. Go to the 11th page. Step 28. Click on the speaker. Step 29. Stay on the 11th page. Step 30. 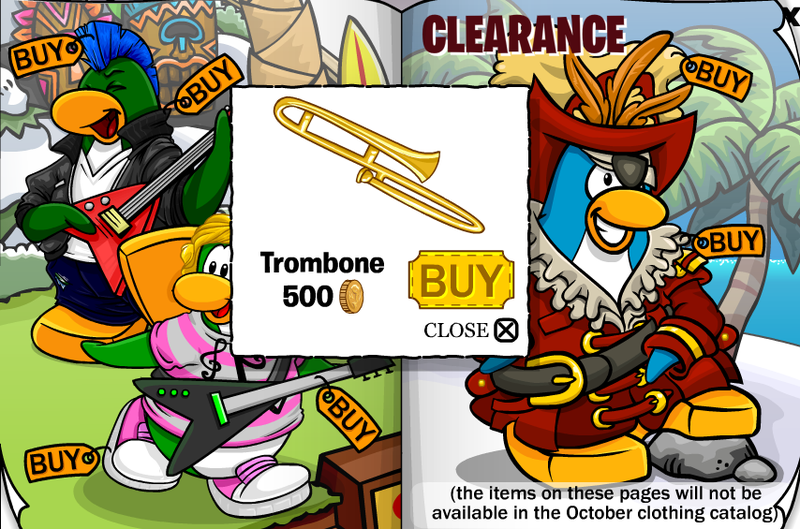 Click on the piano part. You now have the Red Sunglasses cheat! Step 31. Go to the 12th page. Step 32. Click on the Tiki. 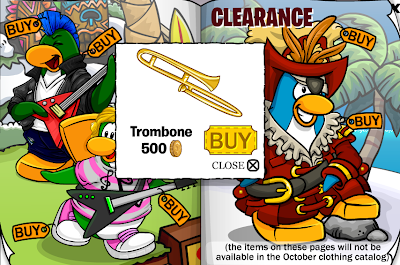 You have found the Trombone cheat! Step 33. Go to the 14th page. Step 34. Click on the bubble. 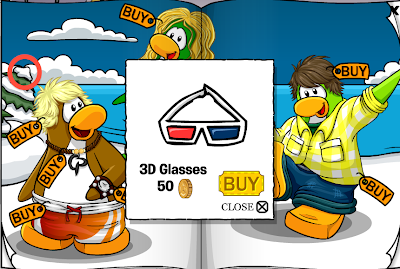 Step 35. Stay on the 14th page. Step 36. Click on and off the bubble four times. Whoa! 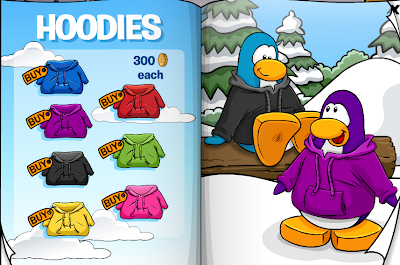 Very sweet cheats and new hoodies! What's your fav? 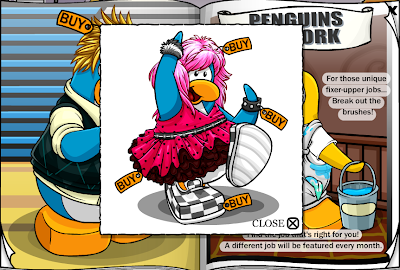 I loooove this catalog except the fact I cant buy much! Yes Alex! 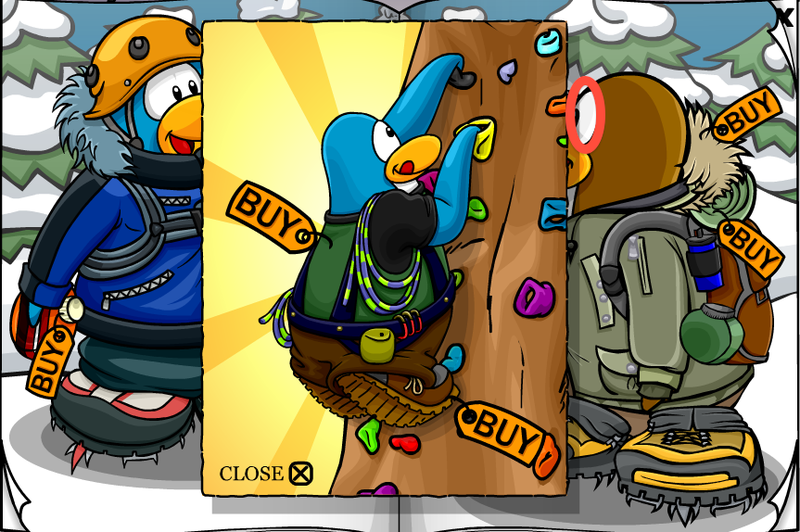 We cannot buy anything old..i have the hoodies but i dried that old background but it didnt work! Maybe tomorrow..
Wow. 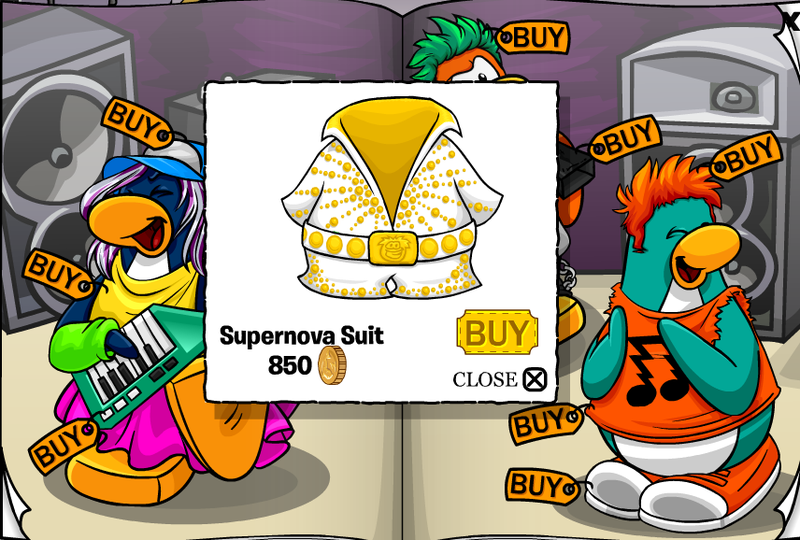 I've never seen a yellow hoodie before! I love this catalog because I've been waiting for the red and blue hoodies. 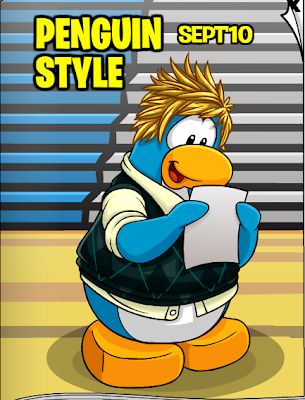 Yeah, a white hoodie would be cool. What about a black one with a big red target in the middle? Problem was fixed around 6:30 last night. Why did disney have to bring back the Black purple green and pink hoodies they've been round enough! I mean c'mon disney there making our penguins no longer rare because there bring back the old hoodies and items! Its so annoying, why cant they bring new items out instead of the old ones coz they WERE rare until disney brought em back! 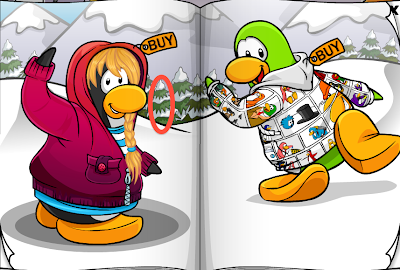 Most of the hoodies have been round since 2005 when it started and its getting kinda crappy now they've brought the old items back! Is it just me or is that comic strip hoodie like THE BEST EVAR! You JokingJamie is a joke. Let all the hoodies bring back. 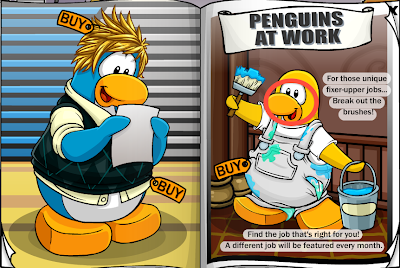 CP needs a little fun instead of talking about Disney. 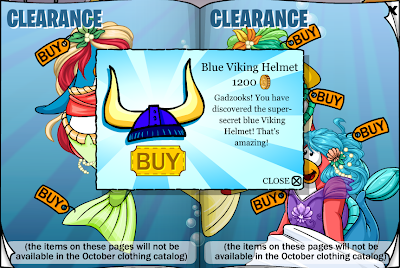 I'm really annoyed when people keep talking about rarity. Blah blah its just nothing. Exactly! I do not like how they did that! (hey, hate is a strong word!) 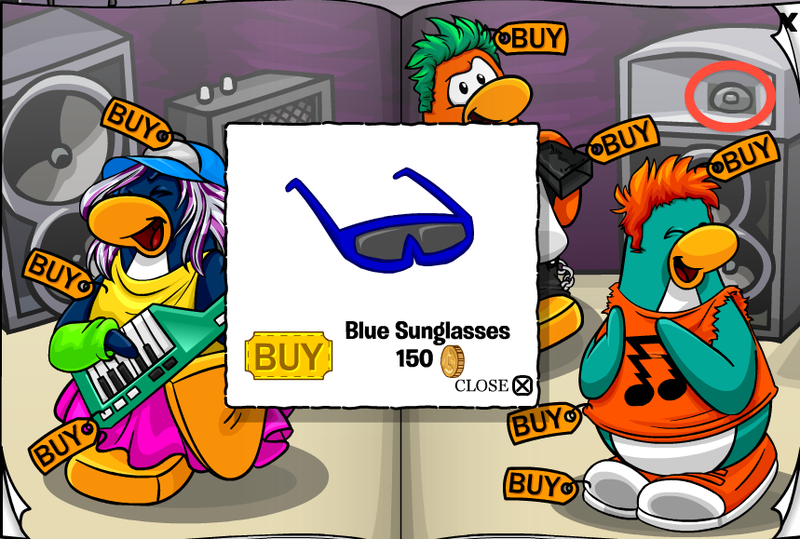 they brought back my very first items ever! It may mean nothing to u but it means a lot to us, ok? 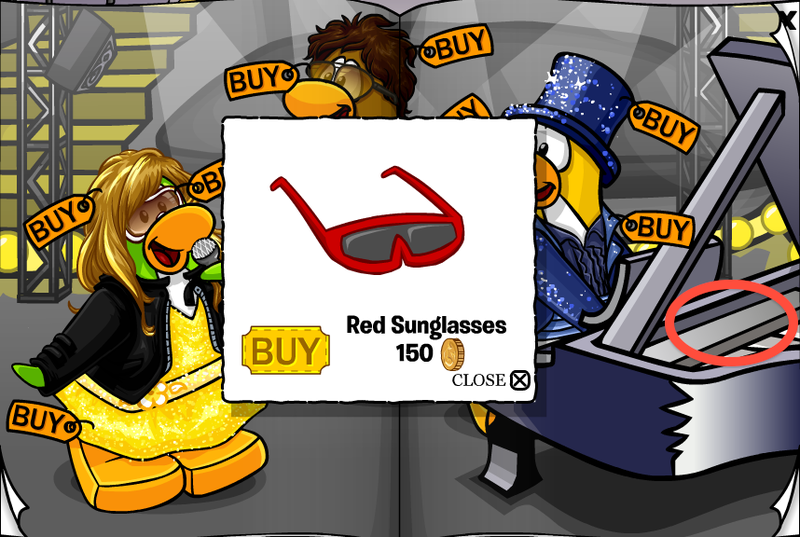 I used to be like one of the few people who had a red hoodie and now u can buy it again. 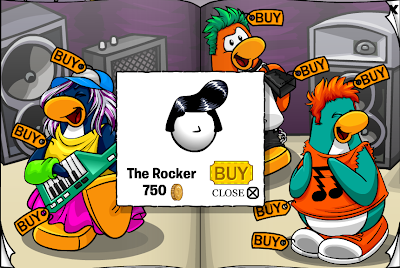 They evven brought back my first item ever (the map background from rockhopper) to buy in the catalog! That made me so annoyed! If you dance with a green hoddie on you will turn old blue! Its AWESOME! Hey. anyone know when the flutterbye hair is coming again? 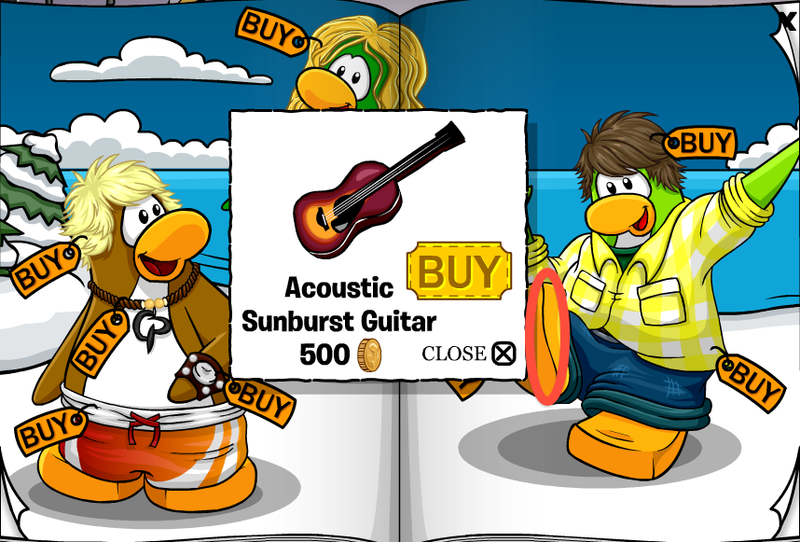 i would LOVE to buy it!! its the shiny brown hair with a butterfly in it!